Hey there, I'm getting in under the wire here for the Simon Says Stamp Wednesday Challenge. I love flowers and just had to do this challenge. This is a terrible photo, but I tried. If I can get the other ones uploaded I'll update this one. Anyhoooo, I created this one by 'smooshing' distress oxide inks with a watercolor panel. 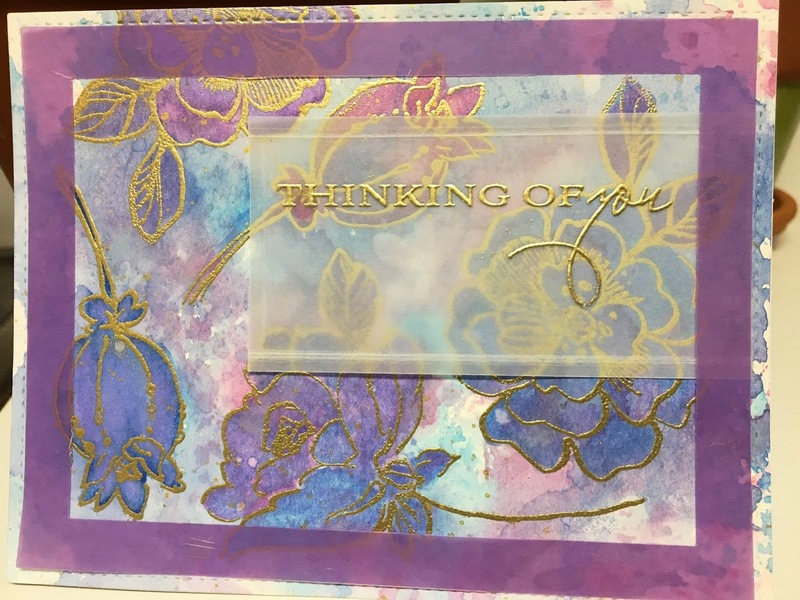 Once dry I stamped the floral images and embossed with gold. I then colored over the embossed images with some watercolor markers. Next I die cut the panel with a stitched rectangle; then die cut a frame out of lavender vellum to lay over the finished panel. Because of the busy floral background I could use regular adhesive to adhere it. Lastly, I stamped the sentiment and gold embossed that and cut it to a small rectangle and scored it to give it a more finished look. Thanks so much for reading this and the materials used are listed below. Your vibrant colors look great with the gold, Mary! Thank you for playing along with us at the Simon Says Stamp Wednesday challenge!